The Phonebook has become a lot more social with iOS 6. Although there have been workarounds to adding Facebook information to your contacts (including Facebook's native iOS app) in the past, this is the first time users can have Facebook details to their contacts without much hassle. If you choose to send your contact information to Facebook, it will cross-reference all the names in your friends list with those from your contacts and add missing information like profile pictures, birthdays, addresses, etc. In case you have two contacts with the same name in both services iOS will automatically join them, and it did a good job of finding people and improving their contact information. Facebook will add all the people from your friends list into the Phonebook so if you want to remove them but still keep the new data on your existing contacts you can disable Facebook's contact access. Otherwise the Phonebook has retained its excellent usability. Editing a contact is intuitive and gives you the option to include lots of additional fields, like multiple addresses, related people, web, email, birthdays, custom fields, and so on. You can set different ringtones, message tones and vibration settings to your favorite contacts. If your contact supports FaceTIme calls, you would get a special icon in the contact details. iMessage and FaceTime have separate settings for Caller ID so there's plenty to configure. The iPhone 5 held onto a signal very steadily and we experienced no issues with it. 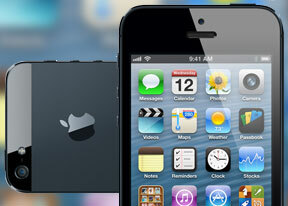 The dual-antenna design has been carried over from the iPhone 4S and both phones held to equally strong signal levels. The iPhone 5 also supports HD Voice, which is a carrier-dependent feature that drastically enhances the sound quality of calls. It requires that the devices on both ends support it - many Nokia phones carry the feature, as well as a few Android smartphones. We made our test call between an iPhone 5 and a Nokia N8 and we can safely conclude that it makes a serious difference over regular voice calls. The sound came in noticeably clearer than usual, and you could hear more detail in the voice at the other end. A new (well, new to iPhone) feature is Reject call with SMS. You can use any of the suggested templates or create a custom one, or just set a reminder to call the person back. With this last feature you can set to remind you to call back a person at a particular location or when you're leaving the current one, which is a nifty trick. Keep in mind that doing so will invoke constant use of GPS, which could in turn lead to a significantly reduced battery life. We gave the service a spin over 3G and got clean video and a stable connection while the 720p front-facing camera on the iPhone 5 made a real difference. The third microphone inside the earpiece also improves the experience and the other side can hear you much better. We performed our traditional loudspeaker test on the iPhone 5, and it shows that it failed to match its predecessor, the iPhone 4S. It's has a slightly less-powerful speaker but not by much. Messaging on iOS hasn't seen any changes, which means you can count on the usual solid experience. The iMessage service lets you exchange instant messages between iOS-running iGadgets over Wi-Fi or 3G. You can send plain text as well as multimedia (pictures, sounds, videos) messages. The iMessage conversations are color-coded to differ from the standard SMS/MMS - their bubbles are blue instead of green. A cool thing about them is that each conversation is synced with the iCloud so you'll have it right there and available on all your iDevices, including your Mac. To activate the iMessage you just need to go to Settings->Messages and turn it on. The Mail app got a few new tricks as well. You can set a VIP list, and emails from people on the list will be delivered to a dedicated VIP mailbox and will appear highlighted in your standard inbox. You can also set a different notification regime for VIP emails - so they appear on the lockscreen, for example. You can also flag important emails. After you flag your first message, a new Flagged mailbox will appear gathering all of your flagged emails in one place. If you use multiple email accounts, with iOS 6 you can have different mail signatures for each of them. The update button is now gone and you can just swipe down to refresh instead. Another new feature lets you insert pictures or videos while composing an email - just tap and hold on an empty space and use the popup menu. If you open your Inbox and hit the Edit button, you now have a Mark key alongside Move and Delete. You can also mass mark emails as read/unread or flag them as important. Unfortunately, a 'Select All' option is still missing. You can also add or delete Mail folders - just hit the Edit button while in an account. Bold, Italic and Underline font styles are available in the text editing options, as well as quote font size levels. Text selection works the usual way (tap&hold and select) and the available options will appear as soon you've made the selection: Cut/Copy/Replace/Bold Italic Underline/Quote Level. Quote Level will increase / decrease the quote symbols of the text you're quoting. The built-in dictionary is very rich in content and conveniently works offline. You can now attach images and video straight from an email, sparing you the need to go to the gallery and select the share option. The keyboard has remained unchanged, and it's the same size as before in portrait mode. Flipping the device over to landscape mode will make it slightly taller than on the 3.5" screen of the 4S, and with slightly bigger buttons. Dictation is available courtesy of Siri: just hit the dictation button on the left of the space bar and fire away. Keep in mind that the performance degrades in noisy environments. You can also shake the device the undo the last words typed.